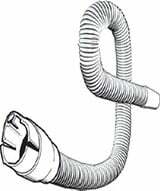 You are buying the SleepStyle 600 CPAP Heated Thermostat Breathing Tube 900HC522 CPAP, manufactured by Fisher & Paykel. Fisher & Paykel is a leading manufacturer of CPAP Machines and CPAP accessories. At ADW Diabetes, we do offer the complete product line by Fisher & Paykel at discounted pricing. You are buying the SleepStyle 600 CPAP Heated Thermostat Breathing Tube 900HC522 CPAP, manufactured by Fisher and Paykel. Fisher and Paykel is a leading manufacturer of CPAP Machines and CPAP accessories. At ADW Diabetes, we do offer the complete product line by Fisher and Paykel at discounted pricing. Replacement heated CPAP tube for Fisher and Paykel SleepStyle 600 Series CPAP machines. Six feet in length, this heated CPAP tube is designed for use with the SleepStyle 604 and SleepStyle 608 CPAP machines with integrated humidifiers. ThermoSmart technology helps prevent condensation or rainout in your CPAP tube, which means no more surprise splashes of water through your CPAP mask.